There is always room in our kitchen for good fusion cuisine and these Asian chickpea rice paper tacos are just that. Rice paper gets fried to a crisp to make for a unique take on a taco shell that is light, crispy and totally addictive. These rice paper taco shells get filled with Asian chopped salad and topped off with tamari roasted chickpeas, avocado, cilantro & a squeeze of lime – for a taco that is not only delicious but just happens to be vegan too! I partnered with TheFeedFeed and Earthbound Farm to create a unique recipe featuring the new Earthbound Farm Organic Asian Chopped Salad Kit and after all of my daydreaming about what I would make, I ended up creating these tacos and I must say, they are incredible! I wanted to make this recipe vegan because the Asian Chopped Salad Kit from Earthbound Farm is vegan, so I chose chickpeas as the protein for the tacos. They get marinated in a blend of tamari, oil, coconut sugar, ground ginger & chili flakes and then they get roasted until they are golden brown and slightly crisp. 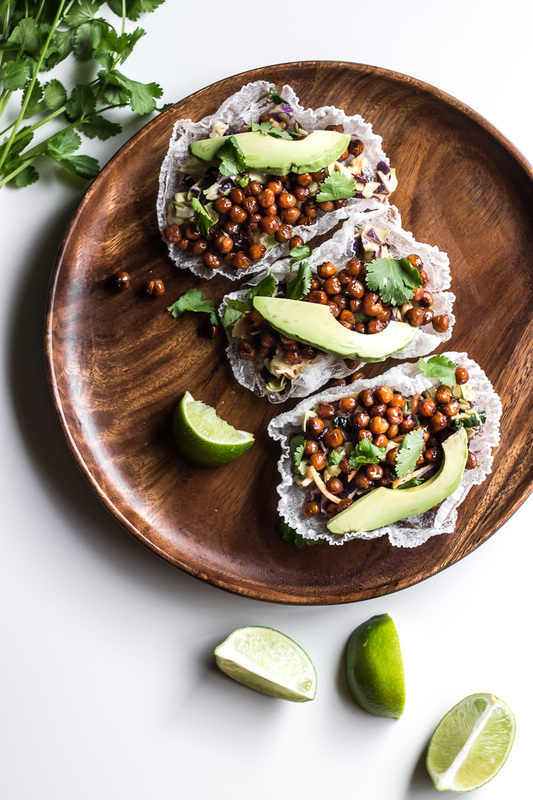 These Asian chickpea rice paper tacos couldn’t be any simpler to pull together – while the chickpeas roast in the oven, you toss together the Asian salad kit, fry up the rice paper taco shells, prep the avocado, cilantro & lime wedges and you are just moments away from an amazing meal. 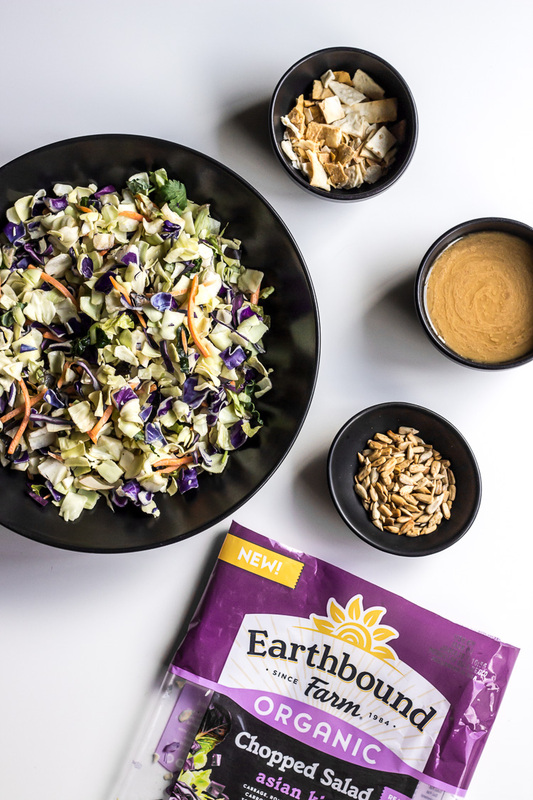 The blend of cabbage, romaine, kale, carrots, cilantro, crunchy topping and tahini dressing that come in the Asian salad kit made for the perfect combination of flavors and textures alongside the tamari roasted chickpeas. The avocado lends its creamy goodness and the cilantro & lime pull it all together for an Asian taco that satisfies all of our cravings while also being super refreshing. While I used the Asian kit in this recipe, they also make it in Southwest and BBQ Ranch - both of which would be great substitutes in this recipe - although, not vegan. Once the chickpeas are done roasting, assemble the tacos by filing each rice paper taco shell with some of the Asian chopped salad, a scoop of chickpeas, a slice of avocado, cilantro leaves and serve with wedges of lime.